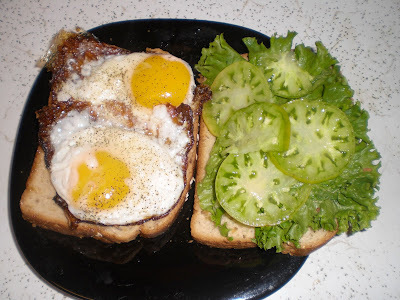 With the recent green heirloom tomatoes, I made a delicious egg and tomato sandwich. I just love the look of the green tomato sliced. Isn't it gorgeous? It's incredibly easy, just cook eggs the way you like them. In my case, I love fried eggs. Slice the tomatoes, add salt and pepper. In egg sandwiches, I love to add ketchup. A bit of lettuce on whole wheat bread. I still don't know what kind of heirloom it is, but it's delicious. A little sweet and tangy. Find other Garden to Table recipes at Greenish Thumb. That green tomato looks delicious. I've never grown green tomatoes, I'll add that to my list of things to try next year. Can't get over that they are ripe and green. Generally down here in the South (Mississippi) green tomatoes are usually mealed and fried! Mmmm...that sandwich looks mighty tasty!! this looks like comfort food ... and perhaps the inspiration for Dr. Seuss' Green Eggs and Ham children's book ... just plain beautiful!